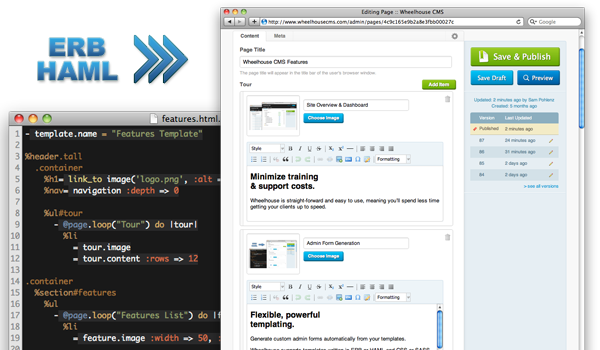 Or use Rails-based APIs to build your own custom plugins. Let your clients edit their site content with ease, without fear of breakage. See your site's structure at a glance and keep tabs on recent activity. Upload & organize images; embed Youtube, Vimeo, Flickr and more. With Compass and Sass at your fingertips, creating beautiful themes is easy. Search-engine friendly URLs, titles & meta tags, as well as automatic sitemaps. Page versioning with full history tracking lets you travel through time. Easily incorporate Blogs, Forms & Galleries or develop your own plugins. Ensures your site remains responsive during periods of heavy traffic. Multiple access levels and secure administrator login. Keep your site between you and your client while it is under development. Assist your site visitors by defining specialized content for your 404 pages. 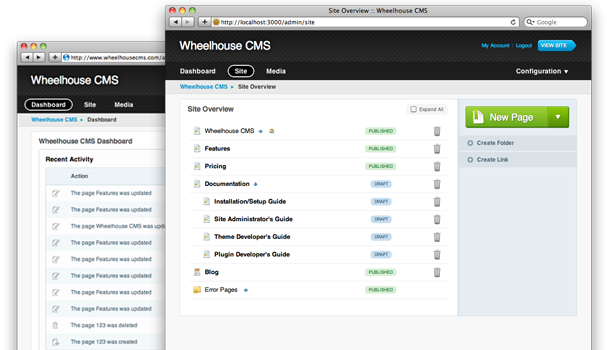 Extend an existing Rails app or build on top of the Wheelhouse CMS framework.